So with that in mind, I've been slowly transitioning into wedding planning mode. Note that I say slowly but SURELY. Let me backtrack however, to this morning's breakfast! May I? Last night I had a crazy hankering for some cinnamon rolls when I suddenly had the epiphany of the year. Well, at least it sure beats my last cinnamon roll flop haha! Oh yeah...are you drooling yet? As if the flavor and aroma wafting through the air wasn't enough this morning, the recipe is also quite simple and it makes for a quick and lazy easy fix. It also includes one of my new favorite (not so wholesome) breads, and that's Challah bread. Boy do I love eating this stuff!! You can sub it for any other thick type of bread. I just happened to have this on hand. Start the process the night before you make it for breakfast. First, lightly grease a baking pan or pie pan and fill it with all the pudding ingredients except for the bread+butter+cinnamon-sugar+flaxseed. Whisk it thoroughly and then add the cubed bread and gently toss it so everything is evenly soaked in liquid. Then, sprinkle the flax seed on top. 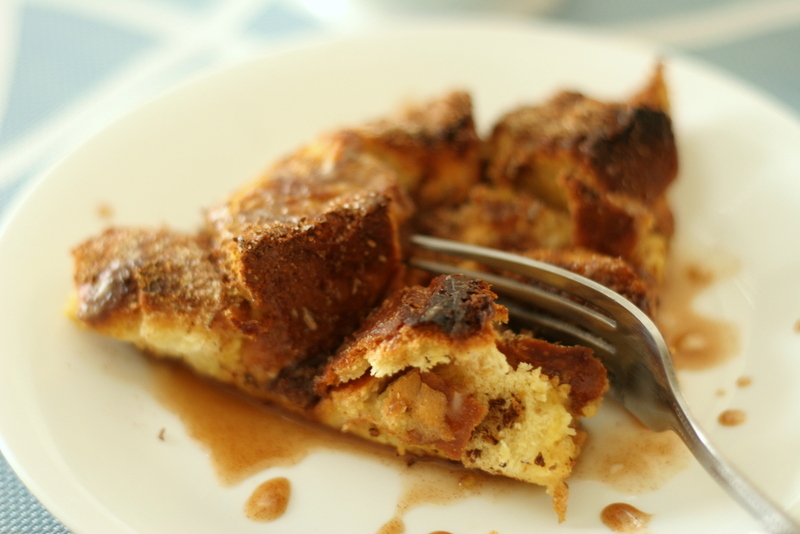 The next morning, preheat your oven or toaster oven (what I used) to 375 F.
Sprinkle the cinnamon-sugar all over the bread pudding to suit your taste. Top it all off with the butter pieces evenly throughout, and pop it into the oven. Bake for about 15-17 minutes until it's crispy on top. Serve it with the glaze drizzled on top. Ta-da!! For the glaze, just mix everything together until it's well incorporated. The texture is so soft inside and crispy on the outside. Watermelons have been a staple fruit around my house because they're always on sale! Not to mention, it has great hydrating properties, yay! Alright so going back to earlier today, I got to spend some time with my momma!! She is always such a busy woman but today she finally got to rest. We get to spend time together alone once every year on average. I took her to the mall and she just had a blast lookin' around and being her cute and silly self. She acts like a sweet child in a candy store, and I truly mean that in the nicest way! I love my mom so much...And I'm thankful for her as a gift to me. Later at night I met with my friend Susan. She's not only a great sister in Christ and friend to me, but she's also my MAID OF HONOR. We had such a great time catching up and discussing some of the wedding deetz. while I had a Squash Chicken Salad. Both were humongous servings and we ended up sharing. Delicious indeed! We flipped through some magazines and brainstormed about the color schemes+the theme of the wedding. In addition, Susan confirmed that these colors would probably look great together: ivory, woodsy brown, pastel green, and lavender. We've set the date to March 24th and although it is quite a while away, the more I talk about these things, my heart goes aflutter. More than anything, I can't believe that God has brought us this far and we are looking forward to His molding our hearts and lives, as well as our relationship, each day. And lookey what came to my email just now...I think this devotional pretty much reminds us to stay open to God's wonderful plans and always trust that He knows us better than we know ourselves. Whether you're male/female, what wedding theme describes you? Will you make this breakfast like, NOW? You really won't regret it! That is...if you like bread pudding. Or if you're brave enough.